A national regulation was unveiled in October 2004 to require labels on edible oil that is made of genetically modified resources. China will work towards finding wider applications of agricultural biotechnology in the next five years because the sector's growth is important to the country's overall development. The country has already worked out its biotech development strategy for the 11th Five-Year Plan (2006-10), according to Qi Chengyuan, director of the High and New Technology Department under the National Development and Reform Committee. Within the strategy are efforts to develop the biotechnological seeding of major crops, also called genetically modified (GM) crops. China will also increase its investment in safety monitoring. A more comprehensive and accurate safety evaluation is required for the further commercialization of GM crops. In genetic modification, genes from outside sources often from other kinds of crops or bacteria are transplanted into the crop. The process has been proved to increase insect resistance, salt and drought tolerance, and anti-herbicide and anti-crop disease traits. The most frequently used outside gene is derived from bacteria called Bacillus thuringiensis, commonly called Bt, which makes cotton crops produce a chemical that kills bollworms. Agricultural biotechnology is the field in which Chinese research is closest to its US counterpart, according to Zhu Zhen, a leading rice scientist and the deputy director of the Bureau of Life Science and Biotechnology at the Chinese Academy of Sciences. According to the China Bio-Industrial Report, released by China National Centre of Biotechnology Development, the Ministry of Agriculture had approved 585 GM plant experiments, including 154 environmental releases and 48 pre-production trials, as of mid-2003. The Chinese Government approved commercialization of GM cotton, tomatoes, pimientos (Spanish pepper) and a species of morning glory in the late 1990s. Commercialized planting of Bt cotton was introduced in 1997. Today more than 66 per cent of China's fields devoted to growing cotton are that type. Last September, Guo Sandui, a leading scientist of the Chinese Academy of Agricultural Sciences (CAAS), successfully developed a new hybrid variety of GM cotton that can not only kill worms, but also increase output. "If the hybrid variety of Bt cotton spreads across China, farmers can save up to 10 billion yuan (US$1.2 billion) per year," Guo said. GM planting has been spreading faster in developing countries. According to a report of the International Service for the Acquisition of Agri-biotech Applications, which was released in January, four new countries accounting for a quarter-million farmers planted biotech crops as part of an 11 per cent increase in global GM crop area. Global plantation area of GM crops has soared by more than fifty-fold from 1.7 million hectares in six countries in 1996 to 90 million hectares in 21 countries in 2005. Last year, Iran became the first country to approve the commercialized planting of GM rice in the world. However, China has remained cautious. Last year, the State Agricultural GM Crop Bio-safety Committee, technically the decision-making body for commercialization of GM planting in China, was reshuffled. The number of agricultural biotechnology scientists, who had dominated the committee in the previous session, was changed, according to Peng Yufa, a member of the GM crop bio-safety committee and chief scientist at the CAAS biosafety research centre. Bio-safety and environmental scientists have joined the new committee. The plan is to establish local GM plant safety evaluation bases in cities and provinces and more bio-safety evaluation laboratories independent of the research teams that are developing GM varieties, a source close to the Ministry of Agriculture who requested anonymity told China Daily. One such bio-safety evaluation base was set up in late 2005 in Shanghai. Also, more money will be spent on improving the equipment of GM crop testing so that scientists can better monitor the possible floating of the transplanted gene, such as the one modified by Bt, from the targeted plants to the environment, the source added. Zhu Zhen, the leading scientist to promote the commercialization of GM rice, said he believed the new bio-safety committee and the increased bio-safety investment will help increase the number of biotech applications in agriculture. "The better regulation of the GM plants is a good thing," Zhu said. "With more bio-safety and environmental scientists joining the review team for GM crops, the team will have more direct experience on the safety and efficiency of GM technology." 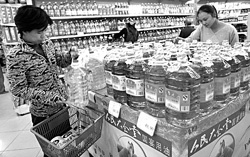 So far, none of the major crops, such as GM rice, wheat and corn, has been commercialized in China, although GM crop researchers claim no evidence has been found to show that genetically modified products harm the health of mammals. Zhang Yongjun, a senior research fellow at the Institute of Plant Protection of CAAS, says that the top bio-safety problem is whether the insects that Bt crops are targeting - mainly bollworms - will develop a resistance to the crop, thereby becoming super pests. So far, refuge, or a belt of non-GM crops, has been widely adopted in the United States to keep pests from developing that resistance. In China, farmers who grow commercialized Bt cotton have not built a refuge area because the diverse planting structure has resulted in a form of natural refuge, Zhang explained. Zhu suggested that the diverse planting of rice and wheat will also produce a natural refuge. But Zhang said the scenario might be different if GM rice is commercialized. Cotton farmers often have to plant some food crops, but rice farmers are very likely to introduce one type of GM rice to maximize their returns because their areas of arable land are so small. "If any GM crop goes commercial, very serious and reasonable policies, such as subsidizing farmers whose land becomes a refuge, must be worked out," Zhang says. Another realistic problem is that although the bollworms have been curbed by Bt cotton, other minor insects, such as reuters (Cyrtopeltis tenuis), have risen to become major threats to the crop. So far, farmers use broad-spectrum pesticide to kill reuters. But although the efficiency brought by GM cotton is better, the process has threatened farmers' health. Zhang said some specific pesticides must be developed against reuters. "As a whole, the efficiency of GM cotton has not been offset by the rise of minor pests or other problems," Zhang said. "But we have to be more cautious in developing major GM grains whose situation might be more complicated." To scientists promoting GM crops, there is also a risk. When their GM crops become commercialized, other types of crops overtake them in terms of yield. As a result, farmers may not believe that killing more insects alone is reason enough to switch to raising the new crops. Ma Tianjie, vice-campaigner for Greenpeace China, says that the increased efforts in bio-safety evaluation should not automatically result in the commercialization of GM crops. "The evaluation process remains less transparent and the public still do not have a say in the decision-making process," Ma said. "Before commercializing any GM crops, we must consider all possible preventive measures against its potential harm."